Dinner at Wayward Owl. | Photo by Denny Culbert. On a mild winter evening in New Orleans, warm rain freckling the sidewalk, I found myself inside Urban South Brewery’s industrial taproom, knuckle-deep in a paper boat of boiled shrimp. I peeled away the shells and popped pink shrimp into my mouth, chased by sips of hazily tropical Holy Roller IPA, poured by the bartender who’d just cooked my crustaceans on a propane-burner kit. It was an indelible New Orleans scene, decadent and improbable all at once. Justin Boswell of Wayward Owl. | Photo by Denny Culbert. New Orleans was once Southern brewing’s central node, its brewery count peaking at 13 in 1874. But Prohibition, competition and consolidation steadily felled local lager producers such as Regal, Jax and Falstaff. By 2005 only Dixie was left, though the brewery, founded in 1907, was foundering. Dixie had laid off employees in the months leading up to Hurricane Katrina, whose floodwaters dealt the facility a final blow. 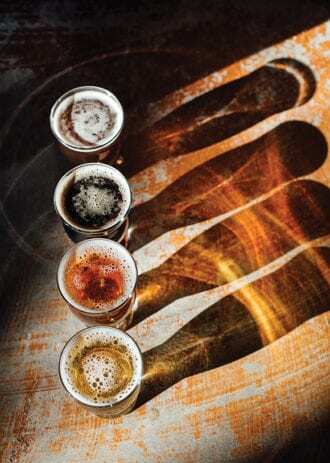 In most emerging beer markets, one brewery leads to two, then four, then scores more. “I was excited because it was so untapped,” says beer journalist Nora McGunnigle, who moved to town in May 2010. “I was excited about how the culture of the city would impact the beer growth.” Spoiler alert: Nothing happened. “It grew a lot slower than I thought it would,” she laments, noting that it took three years for another brewery to open. In the interim, locals were exploring better beer at bars like Cooter Brown’s, the Bulldog and, most notably, Avenue Pub. 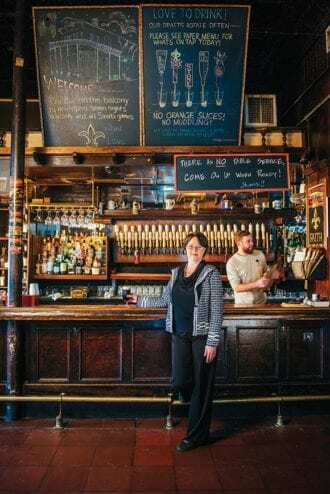 After Katrina, Polly Watts returned to New Orleans to fix up her ailing father’s failing bar—the food was middling, the balcony was inches from collapse and the tap lines were as filthy as the bathrooms. Polly Watts of Avenue Pub. | Photo by Rush Jagoe. He rented a former shrimp warehouse and built Courtyard on a whisper-thin $80,000 budget, rescuing construction materials from dumpsters and constructing the cooler out of two-by-fours and foam, a heavy-duty air conditioner supplying the chill. The build-out resulted in a funky mishmash, rough-edged, soulful and packed with personality, a brewery embodying New Orleans itself. The city’s second modern brewery soft-opened in fall 2014, some four years after Wood tasted his first beer, outfitted with a tiny three-barrel brewing system. 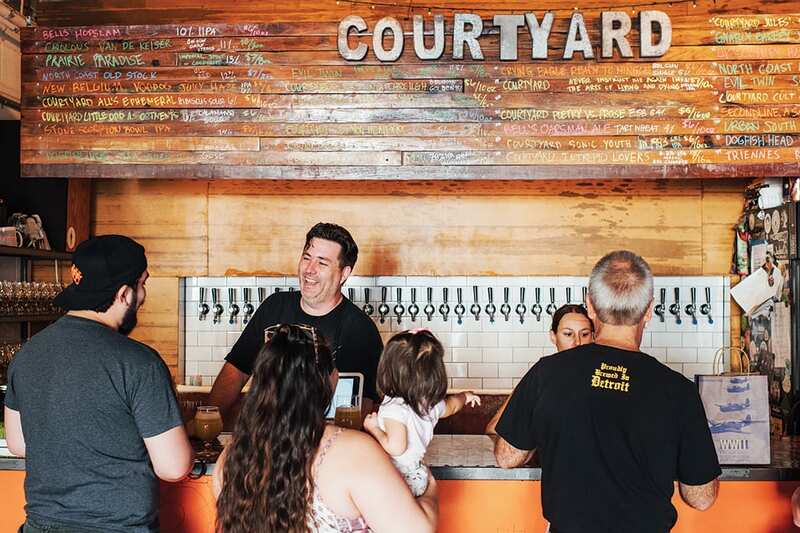 Courtyard’s unique license allowed Wood to sell his hazy, aroma-rocked IPAs alongside beers from stalwarts, such as Founders and Bell’s. The brewery was a round peg that fit snugly into a gaping hole. “There wasn’t a place in the city or the state that was focused on American craft, and I think we hit that niche,” Wood says. Courtyard Brewing. | Photo by Denny Culbert. Landry grew up in rural southwest Louisiana, then a career in public education took him to Seattle. During travels throughout the Pacific Northwest, he noticed how entrenched taprooms were in everyday life. “You go to a city like Portland, and the idea of a taproom as a destination or a place to drink is much more developed than it is [in Louisiana],” he says. A flight of beers at Wayward Owl. | Photo by Denny Culbert. Urban South opened in the spring of 2016, offering beers with appeal both broad (pilsner, witbier, Oktoberfest) and local, including a Vietnamese coffee stout. The brewery sits on Tchoupitoulas, joining NOLA and Port Orleans to form a burgeoning brewery corridor. Additional newcomers include Mid-City’s Second Line Brewing, named after the city’s joyously jazzy parades, which opened in 2015 and has a kid-friendly beer garden and beers such as Saison Named Desire, brewed with blood oranges. Brieux Carré, which opened in the spring of 2017, serves coconut milk stouts near music-rich Frenchmen Street, its wood-walled patio a refuge from the nearby French Quarter. Wayward Owl had a more wayward path to its late-2016 debut. Founder Justin Boswell grew up in Lafayette, Louisiana, before stints in Texas, North Dakota and Seattle, where he fell under beer’s spell. He became a brewer at Redmond, Washington’s Black Raven before flying back to his home state to found a brewery with wife Kristin. They homed in on Broadmoor’s landmark Gem, a once-popular African-American theater that shuttered in 1960. Its solid foundation and sturdy masonry construction meant it weathered the decades well. Wayward Owl restored the Gem marquee, the neon aglow at night, and theater-style seats inside the soaring, open brewery. Pop by and you can buy 20-ounce pints of Boswell’s clean Euro-leaning beers, such as Tawny Twit, an English bitter. Like a double bill at the theater, Wayward Owl is where you settle in for the long haul, surrounded by good friends and great beer. Parleaux Beer Lab. | Photo by Denny Culbert. At its core, New Orleans has always been a city of neighborhood bars where locals assemble to commiserate and celebrate another spin around the sun, bar tops crowded with longnecks. People matter more than the beer selection, or lack thereof. Now, better beer is working its way into New Orleans. I bought NOLA Brewing’s Rebirth Pale Ale at ramshackle jazz spot Vaughan’s, while at Black Penny, a weathered dive that opened in 2015 on the French Quarter’s northern edge, a rough wooden wall showcases the bar’s raison d’être: nearly 100 canned craft beers, heavily weighted toward Louisiana breweries, such as Baton Rouge’s Tin Roof and Shreveport’s Great Raft. “You wouldn’t have seen craft beer in the French Quarter seven years ago,” says Urban South’s Landry. The best example of the neighborhood brewery is the Bywater’s Parleaux Beer Lab. Eric and Leah Jensen moved to New Orleans in 2003, hailing from, respectively, Grand Rapids, Michigan, and Golden, Colorado, a suburb of Denver—both huge brewing centers. Jensen worked in public education, but homebrewing had his heart, a hobby he picked up in college. “Growing up in a robust beer community, you just want to learn how to brew,” he says. 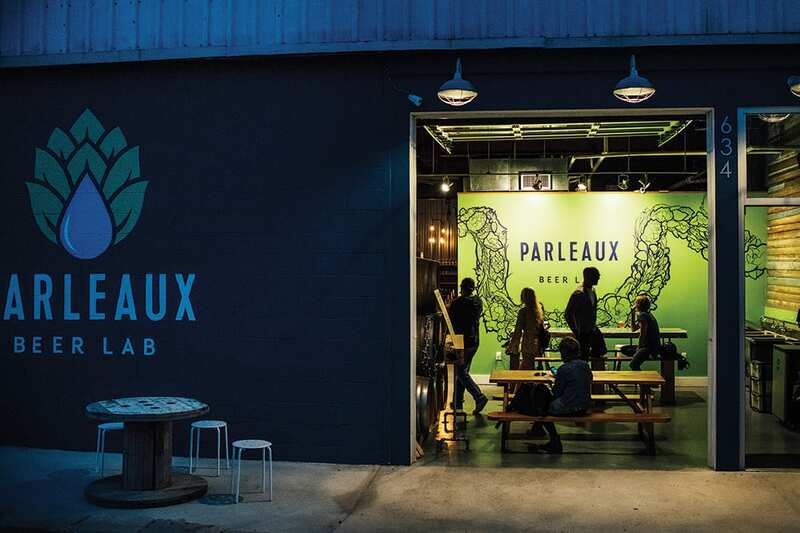 Last spring, Parleaux opened with a moderate-sized 10-barrel brewhouse focused on experimentation and accommodation. Whenever the lights are on, customers can grab beers that dance from the New England–style Foggy Glasses IPA to a blood orange–conditioned gose seasoned with pink Himalayan sea salt, as well as farmhouse-inspired beers fermented with wild Brettanomyces yeast. “The concept behind it being a beer lab is that we always want to do different beers,” Jensen says. 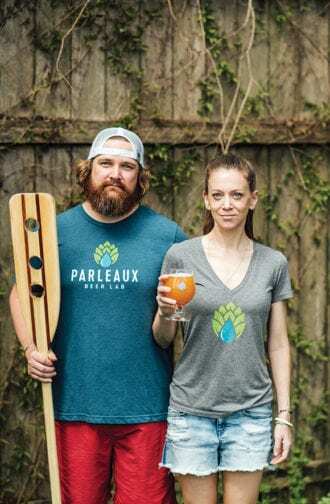 Parleaux Beer Lab owners Eric and Leah Jensen. | Photo by Denny Culbert. 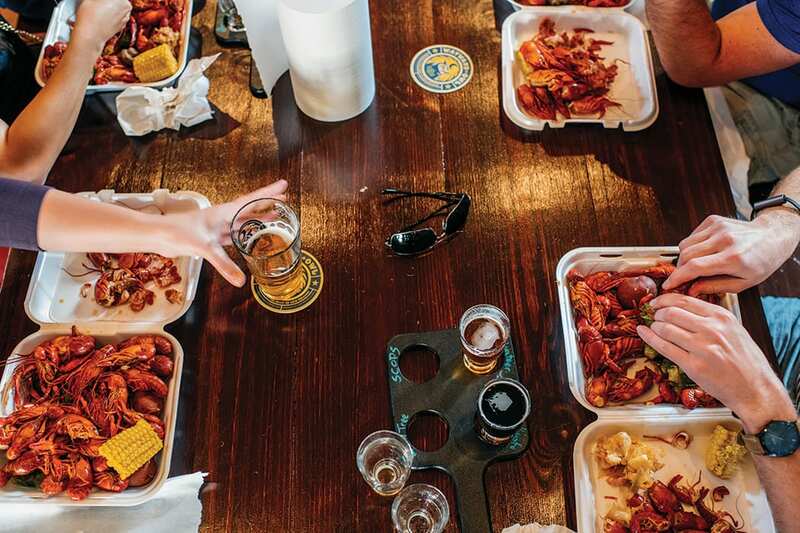 In New Orleans, it can be argued, we’re witnessing a beer scene’s foundational moment. But nothing comes easy in the Big Easy. Though her sales are steady, the Avenue Pub’s Watts sees national beer brands struggling. “I put Stone IPA on, and it just sits,” she says. “Our craft beer is already cannibalizing other craft beer,” she says. The other elephant in the scene is a revitalized Dixie. Last year, New Orleans Saints owner Tom Benson bought the brand. Now, Dixie is everywhere in town, from stadiums to dives. It’s a local beer that currently lacks local roots. 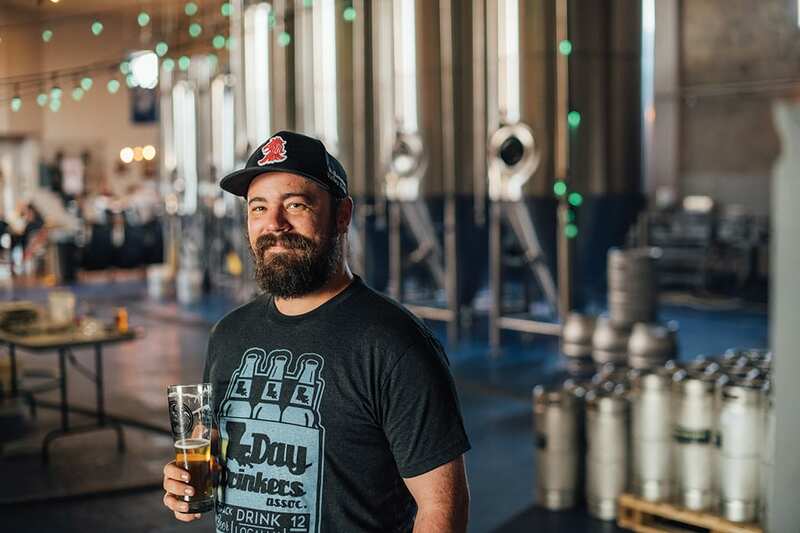 At the moment, the lager is contract-brewed in Memphis, a prickly fact that will only be smoothed over when Dixie returns operations to the city. That’s the plan, although there’s no official timeline set. Nonetheless, there are ample reasons to be excited about New Orleans’ brewing future. It’s a drinking town that’s only now appearing on beer tourists’ radars. Restaurants such as Freret Beer Room and the Stokehold, housed inside Port Orleans, are focusing on food pairings. Moreover, Mardi Gras means that most breweries are cranking at full capacity in December and January, stockpiling beer for what’s traditionally producers’ slowest time of the year. “There’s probably no other part of the country where the first quarter is the biggest quarter of the year,” Urban South’s Landry says. Traditionally, a “shake” cocktail is composed of a dark spirit (in this case, rum), lime and sugar.